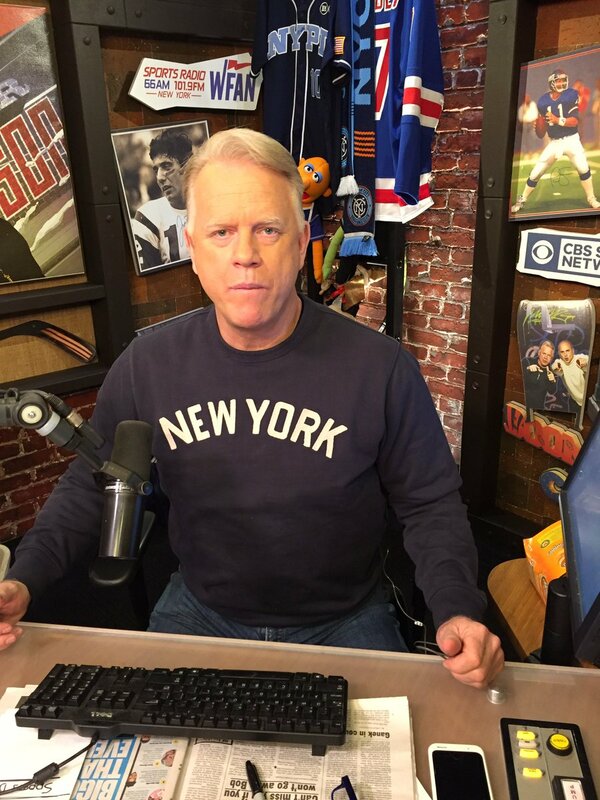 Boomer Esiason was sporting a J.Crew Womens New York Sweatshirt again this morning. Unclever Al Dukes et al. at the Morning Show with Boomer & Gio trotted out the lame, "Is Boomer wearing a Yankees shirt?" poll yet again, too. Is Boomer wearing a Yankees shirt today? Wait, you ask, "What do you mean, again?" That's right, again. 3/24/17, Boomer & Carton tweeted, "This is the shirt in question. Is it a Yankee inspired shirt?" Same shirt. Just a little (wee little) bit less tight. And Boomer played the same game. NO its not. Its from @jcrew and their Wallace and Barnes collection. So get off my back! The major difference? Craig Carton then got the same shirt and wore it on air. It’s one thing not to be entertaining it’s another to repeat bits that he did.